The Bakken energy field amounts to the largest domestic oil discovery since the one at Alaska’s Prudhoe Bay. Stretching over North Dakota, South Dakota and Montana (also into Canada’s Saskatchewan province), the amount of recoverable oil in this region could do away with any need to import the precious commodity. Small cities in western North Dakota have been overrun with eager job seekers who are benefitting greatly from the need for more and more workers. But there’s a need for a pipeline to transport this oil to refineries in states to the south. Not only is the Bakken capable of releasing OPEC’s hold on our nation, additional discoveries now known to exist under the Rocky Mountain states hold an estimated three to four times what is being tapped in North Dakota and its neighbors. Shortly after beginning his second term in 2005, President George W. Bush gave the order for extracting this treasure. But nothing has been done. The Keystone pipeline project proposes to ship crude oil from the Bakken and from Canadian oil sands projects to refineries in our nation’s southern states. But hurdles are still blocking its construction. If the Keystone pipeline were constructed, there would be no need for imports from unfriendly Venezuela and unpredictable Russia.. Yes, our nation does import oil from these two countries while also continuing to receive imports from the Middle East. Environmental groups continue to block development of known resources and needed pipelines. Is it possible that nations who benefit financially and diplomatically from impediments placed in the way of energy independence are financing some of these environmental organizations? Also, why does our own government continue to be a hindrance rather than helping America to become independent? On the other side of the globe, we see that energy starved Ukraine is highly dependent on Russia for natural gas. But Ukraine is also in dire financial straits, owing many billions for energy already received from its eastern neighbor. American foreign aid, supplied to Ukraine in response to Russia’s annexation of the Crimean peninsula, ends up in the coffers of Russia’s Vladimir Putin for natural gas payments. Is this why he ordered the occupation of Crimea? Should the American people fill Putin’s pockets? The need for oil and natural gas is obvious. But, if our nation acts in proper self-interest, America can gain release from dependence on foreign energy suppliers. Will the Obama administration continue to drag its feet on energy matters? Will the environmentalists be told to get out of the way of progress toward energy independence? Time will tell. Energy independence can be had if U.S. leaders do what good sense calls upon them to do. As Ukrainians well know, being Russia’s neighbor can be frightening. One doesn’t have to go back too far in history to know that the 1930s saw Stalin’s forces led by Nikita Khrushchev create a famine in Ukraine that killed upwards of seven million. Food was either shipped out of the country or destroyed in one of the more barbarous crimes ever committed by man against man. It was even remarkably horrible for the Soviet Union’s monsters. 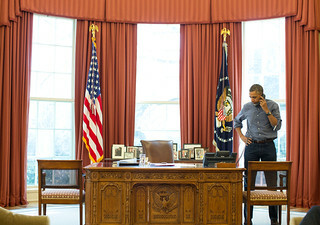 President Barack Obama talks on the phone in the Oval Office with Russian President Vladimir Putin about the situation in Ukraine, March 1, 2014 (official White House photo by Pete Souza, via Obama White House Flickr). Against the desires of a vast majority of the Ukrainian people, their country existed for most of the 20th century as one of the dozen Soviet satellite nations totally controlled by the Kremlin. At the founding of the UN in 1945, Stalin even inveigled a General Assembly vote for the Ukrainian SSR, something that would have been akin to awarding a vote for Puerto Rico that would, of course, have been controlled by the United States. The southeastern portion of Ukraine contains the Crimean peninsula jutting out into the Black Sea. It is, for history buffs, the home of Yalta, the resort community where Roosevelt, Churchill and Stalin met early in 1945. The three carved up Europe and the Far East precisely as Stalin wanted. Roosevelt aide Alger Hiss, a U.S. citizen who was a secret Soviet partisan, helped obtain for Stalin (his ultimate boss) everything the bloody-handed dictator wanted. The two million living in Crimea today are more than 50 percent Russian-speaking. They would likely be happy to see their peninsula become part of Russia while the rest prefer to leave things as they have been for many years. But when the corrupt and ineffective Ukrainian President Viktor Yanukovich was forced out of office only a few weeks ago, factions within the country saw their chances to prevail. So, too, did Russian leader Vladimir Putin, the former head of the Soviet Union’s dreaded KGB, see an opportunity to seize control. He sent more than 100,000 Russian soldiers to boost his chances. U.S. media tell us of grave concern emanating from President Obama, Secretary of State John Kerry, Senators McCain and Graham (both of whom have long indicated their preference for using America’s military power almost anywhere), and others. Troops from Russia have moved in Crimea and a non-shooting face-off developed immediately between them and some outnumbered Ukrainian soldiers. What should the United States do about this crisis on the other side of the world? How about nothing? How about merely expressing hopes that there be no shooting, that common sense will prevail, and that maybe the people who live there will end up deciding for themselves which country they belong to and who their leader will be. The last thing needed is for the U.S. to flex its military muscles once again. American policing of the world has got to stop. Announcing such a new policy would be welcomed by the people of our country and by most of mankind. We believe it would also lead to a more peaceful world, not only in the Crimea but everywhere. To learn more about the Ukraine’s inside players, visit this article from The New American. To learn more about The John Birch Society, visit JBS.org.